Today was Day #5 of Chocolate and Gluten-Free Cookie Theme Week. Yesterday I sampled the Chocolate Chip version of these wheat- and gluten-free cookies from Mary's Gone Crackers. I liked these a little bit better, but these Double Chocolate Love Cookies were good too. These were crunchy and a bit crumbly. 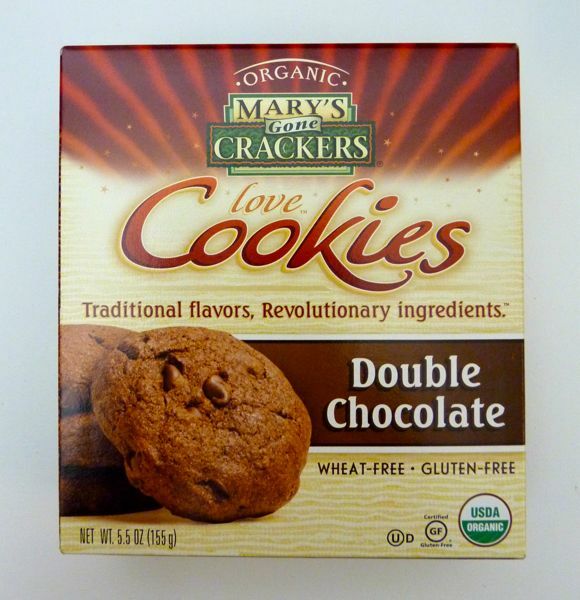 Thumbs up for Mary's philosophy of adding healthy and hearty seeds and grains to their gluten-free crackers and cookies. Due to travel this week and possible lack of Internet availability, I am posting this planned entry "in advance" -- or, I'm trying to perfect the art of chocolate time travel. Note: I completed this review during my trip and updated this post after returning.